So my father has been telling me about his spaghetti squash revelation and now he’s finally (and thankfully) forced it upon me. Upon arrival to the train station for my return trip to DC, he shoved a nice sized spaghetti squash into my bag and sent some accompanying instructions later that night via email. 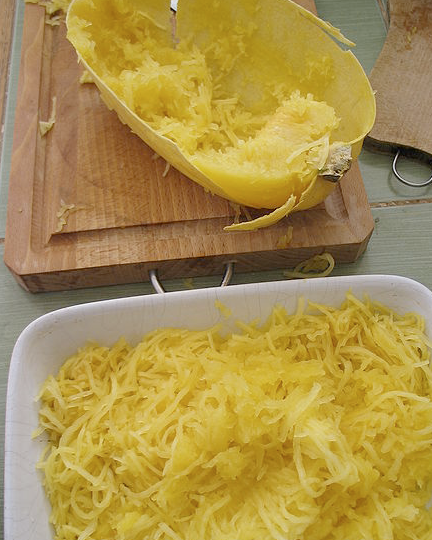 Spaghetti squash is very unique. It’s a vegetable but looks, feels, and even pretty much tastes like real spaghetti. It’s also quite healthy – only 75 calories per 8 cooked ounces and full of vitamins (folic acid, potassium, vitamin A, beta carotene). Check the Wikipedia article here. 3. Cut the squash in half the long way. It’s tough to cut so use a sharp serrated knife but be very careful. 4. Scoop out the seeds and stringy innards into the garbage. 5. Place the squash halves face down onto a cookie sheet that is lined with a piece of aluminum foil. 6. Put the squash into the oven on a middle rack. It’ll take at least 50-60 min so now you should make your sauce/sides (see below). 7. You can use any sauce you’d enjoy with regular spaghetti, and any sides too. I made a nice meat sauce with ground beef, garlic, sauteed onions, fresh tomatoes, and Italian seasoning (let me know if you want specific recipe). 8. For the side, I sliced a couple zucchinis, browned them in a frying pan with butter, salt, and ground black pepper. 9. The spaghetti squash should cook about an hour in the oven, or until a fork can break the outer skin and it feels almost like sticking a fork in a cooked potato. When done, let the squash sit and cool for about 20 minutes. 10. Holding the skin side of the squash in your hand (use pot holder or towel if still too warm), scrape out the strands of the inner squash, down to the harder outer skin. The strands should fall out nicely and look just like spaghetti strands. Scrape the spaghetti right into your plate. 11. Put the meat sauce on top of the spaghetti. 12. 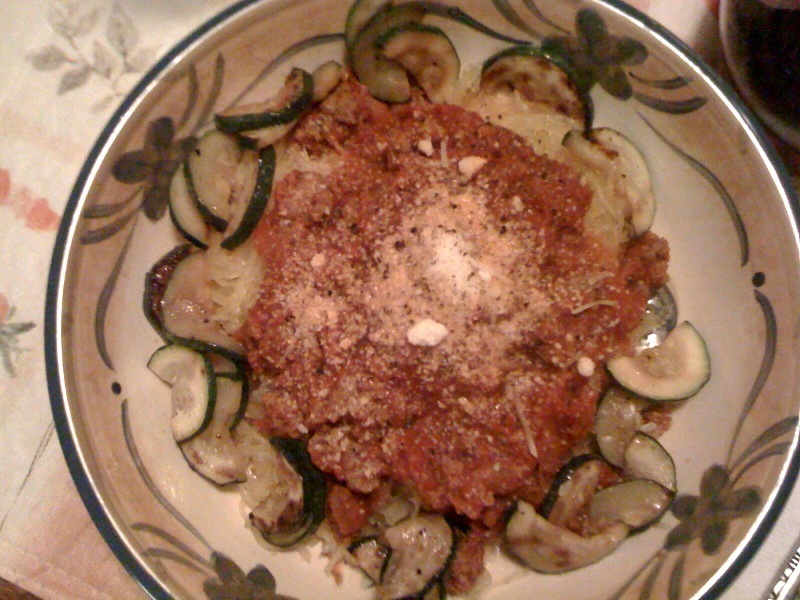 Surround the spaghetti in the dish with the zucchini. …and don’t forget to pair with a nice glass of your favorite red wine and some great company! Enjoy!! !